Pre-requisites: None! Any kid 8-11 years old and their adult can take it. This workshop is for absolute beginners and those who want to learn at the beginner level. Would you like to laugh with a loved one? 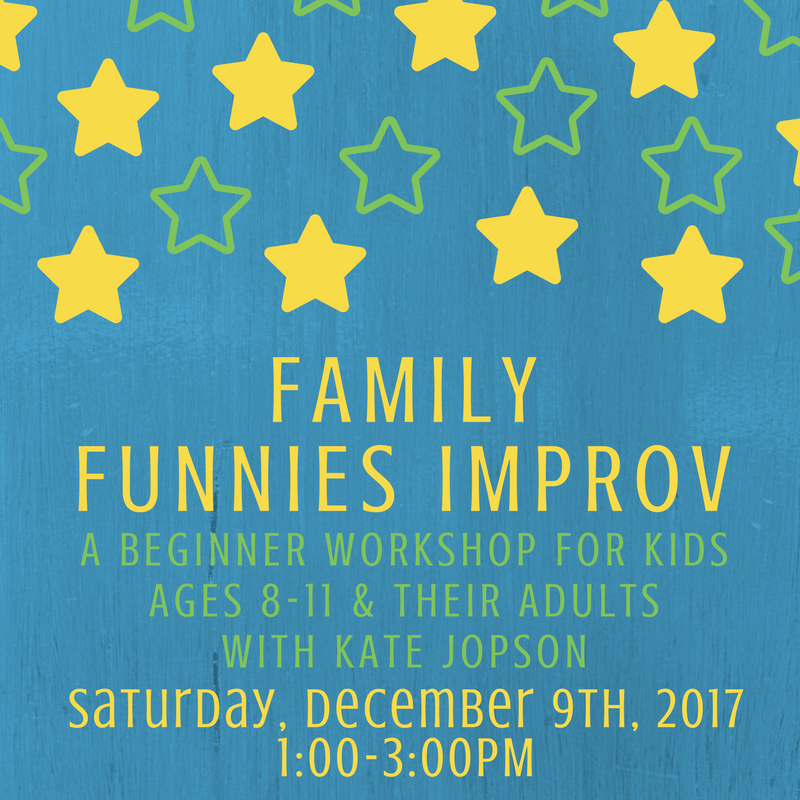 Family Funnies Workshop is a one-time improv workshop geared for kids ages 8-11 years old and their special adults to share the joys of improv comedy games. Regular laughter is good for your health and great for your familys relationship. Improv also is a terrific way to practice important skills like accepting ideas from others, mindfulness, quieting judgment of self and others, communication and more. But mostly, its a ton of fun. Who can take the Family Funnies Improv Workshop? Any kids 8-11 years old and their special adults. Great for kids and their parent, grandparent, aunt/uncle, grown sibling, family friend, Big Brother/Big Sister, etc. - we believe love makes a family! Plus, every kid in the class receives a free ticket to the Happier FAMILY Comedy Show. Laugh with a loved one and let us make your happy family HAPPIER! About your teacher: Kate Jopson is a graduate of the Happier Valley Comedy Schools Zen of Improv classes and a Happier Family Show cast member. She loves teaching and has worked as a middle and high school educator for 5 years. Before moving back home to the Pioneer Valley, Kate studied, performed, and taught at Just the Funny Theater in Miami, FL.